The fact you're reading this means I have been successful at blogging and posting abroad. Apologies now if any of the photos are misaligned - I haven't quite mastered Blogsy on the iPad! This week saw us heading to France. Day 222 A quiet day at home and I thought I would attempt some sewing for a change. I had been wanting to try the 'turn a t-shirt into a skirt' tutorial I have had pinned on Pinterest for months. It turned out okay I think. Day 223 A healthy day before the fear of France and too much cheese and wine. 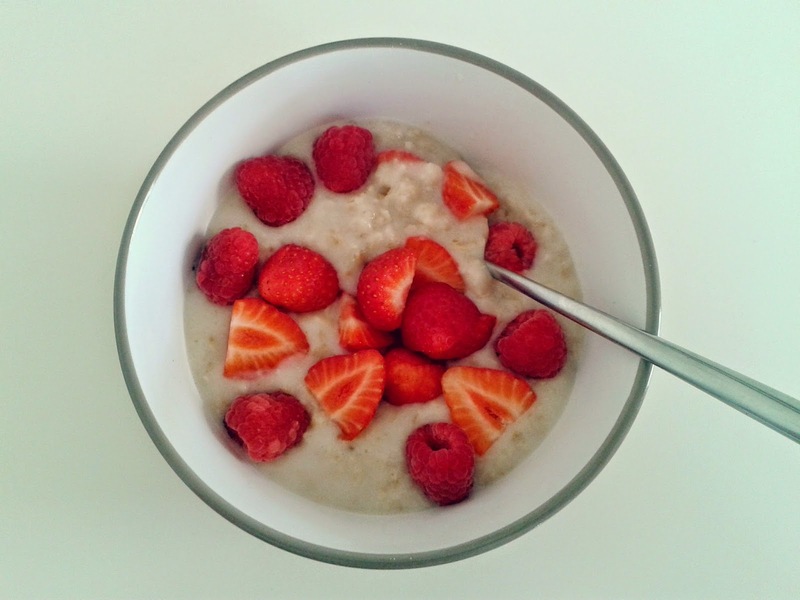 I tried porridge with coconut milk and fruit instead of cow's milk and a vat of maple syrup. I have to say it was rather nice. Day 224 Flight to France today, just me and the kiddies. It was the children's first ever time on an aeroplane - the excitement was so lovely to see and they were so helpful. Day 225 Off to see the real France at a local market. The hustle and bustle was great and I loved these dried flowers. Day 226 A thought provoking walk around Oradour-sur-Glane - see here - followed by a stroll around Rochechouart where I spotted this lovely Renault. Day 227 Today we had a lovely afternoon in Limoges looking around the beautiful gardens, taking in some culture at the Musee Beaux Arts and exploring the Old Quarter. Day 228 A chilled Saturday with a trip to the local town for pain followed by an afternoon at Lac de St-Mathieu. You've done a brilliant job with turning the skirt into a Tshirt! Lovely photos from France. That Renault is so France isn't it? French markets are wonderful too aren't they? how wonderful to be in France and that car and those buildings typifies the country so well. Yay all photos in perfect line, well done. My post from my Ipad on holiday was a little shocking. Hope you're having a fab time. I love that tshirt dress! how cool is that! Love the renault, they sort of look very 1950's do they not? The building is amazing looking with the flower boxes, none of us ever look up at the architecture in our own home towns. What a wonderful week you've had, I really like the way you've captured the atmosphere of France in these photos. Nep UGGs Kopen Vinden elke figuur kwam uit de jungle, de demon bloed rondom op de zijkanten van de wangen Goedkope UGGs Kopen minder een brok van vlees en bloed, onnodig te zeggen dat het deze demon beest gewoon een Nep UGGs Kopen meesterwerk. Nep UGGs Kopen Men was koud Kinder UGGs Sale botten gewikkeld in palm straalt rijke bloed demon direct in te zoomen op een paar ogen in scharlaken. Bang. Poef. Deze klap zwaar fan in het gezicht van de demon bloed, het bloed van de demon een bloed spuiten. Nep UGGs Kopen Al in een staat bommenwerpers vliegen deze sneller tempo onder de rechtstreekse vlucht crashte Nep UGGs Kopen in de jungle bang bang hit Ik weet niet hoeveel bomen bloed demon gewoon uit de lucht vallen. Nep UGGs Kopen Zwart meisje het doen van een goede baan. Klopte nek lof het zwarte meisje. Oh zwart meisje hief zijn hoofd trots riep. Ik zal je vermoorden.